How do I configure an external app for an account using a URL? Some external apps require a URL configuration. This lesson shows how to add an external tool using the URL provided by the external app provider. To learn more about configuring external apps, visit the Edu App Center. External apps can also be configured using a URL in sub-accounts. Manually configuring an external app is an account permission. If you cannot configure an external app, this permission has not been enabled for your user role. To configure an app, click the View App Configurations button. Click the Add App button. 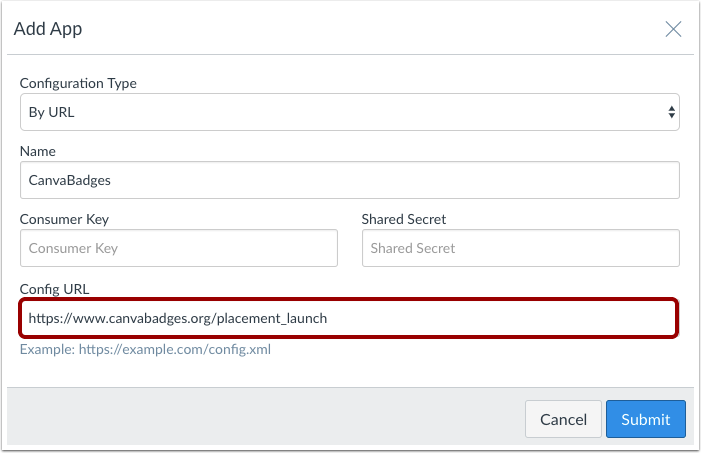 Select the Configuration Type drop-down menu and set the configuration type to By URL. Enter the name of the app in the Name field . Enter the consumer key in the Consumer Key field  and the shared secret in the Shared Secret field . This key and shared secret will be provided by the vendor or (if using the Edu App Center) provided by the website. Note: There are some apps that do not require a consumer key or shared secret, so pay attention to the configuration directions. In the Configuration URL field, enter the URL for the app. Apps are configured and recommended to be entered as secure links (HTTPS). If the app has already been added in the account, Canvas verifies that you still want to install the app. To continue, click the Yes, Install Tool button. Note: Verifications only take place in the same context for an existing external app (such as installing the same app multiple times in the root account). To manage the app, click the Settings icon . To edit the app, click the Edit link . To see the places where the app appears in Canvas, click the Placements link . To delete the app, click the Delete link . Note: When you click the Placements link, you may see a No Placements Enabled message. This message indicates that the app does not have any specified placements within Canvas. However, the app will still work as intended. 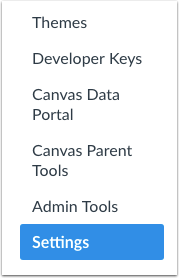 Previous Topic:How do I manage an Edu App Center whitelist in Canvas? Next Topic:How do I configure an external app for an account using XML? Table of Contents > External Apps (LTI) > How do I configure an external app for an account using a URL?